Fashion magazines and television programs are a great place to find inspiration for jewelry design. Not only are you likely to catch a glimpse of some great designer jewelry, but you'll get the scoop on what colors are up and coming in fashion, what kinds of textures are making it to the runway, and what sort of lengths are in style for necklaces and earrings. Although I watch fashion programs intently, looking for inspiration, I rarely see anything on the runway that I would want to have in my closet. That is, until I recently saw a feature on the latest line from Rodarte. These interesting and fantastic designs were so unique, I immediately starting musing on how to capture their essence in beadwork. Something slinky, netted and fierce will be the perfect match for an outfit like this one from Rodarte's Fall 2008 collection. The galvanized oil-slick color of the purple mixture has a rock-and-roll quality that suits this high fashion inspiration. Paired with the softness of white ceylon, the beadwork will shine like a runway diva. Chevron chain is the perfect technique to mimic the funky style of this Rodarte piece. I increased the number of beads in the stitches to get an extra wide band, and added a circular peyote loop to one end to make a fun and slinky beaded belt. Update: Though this two-needle stitch is often referred to as chevron chain, it is not related to the netting technique. Now that December is almost here, it's time that all beaders turned to their gift projects and Christmas decorations. I try to make something for many of my friends and family, and most of my beading time is spent designing pieces that will make great gifts. I prefer to give jewelry that is wearable year-round, but sometimes it's nice to have a beautiful and festive Christmas accessory or two. 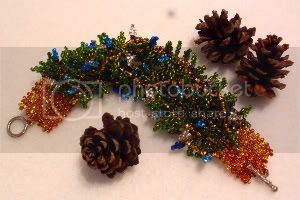 Last year I designed a multi-strand bracelet with leaf fringe and different sizes of beads in natural colors. The effect was nice, but I wanted to try something new this year. Since it's the holiday season, I decided to create a Christmas tree bracelet, complete with white and blue lights. I wanted continuity with the beads, so I chose to use lined varieties for the foliage as well as the lights, rather than a combination of matte and clear. 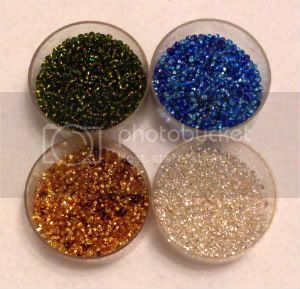 The palette for my bracelet includes: copper lined green, foil lined blue mix, foil lined clear, and foil lined brown mix. Black will also be used as the base for the 'lights'. Overall, I think that the feel of a crisp and classic Christmas tree can be seen. Without any ado, here is the completed bracelet. It can be worn flat or twisted, and the ten strands of thick leaf fringe certainly evoke a feeling of pine needles and flashing lights. Because so many embellishments were added this time around, I've had to adjust the length from my previous design. The finished bracelet measures a tiny 6 1/2 inches, and is a nice snug fit. It would work just as well as a slinky 8 inch bangle as well, with the strands free to move about and sparkle. The clasps are attached to small panels of even-count peyote stitch, which is the most complex part of the design. Although manipulating the strands of beads between clasps can be akward at times - especially when the thread is at it's maximum length - the bracelet is very easy to make. 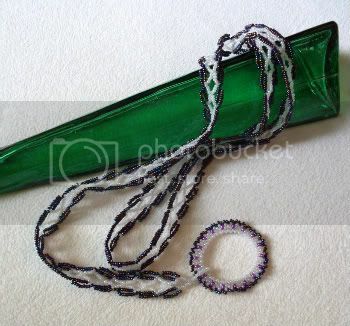 It's a great beginner friendly project that I would recommend for any new beader. And the results are beautiful, too! 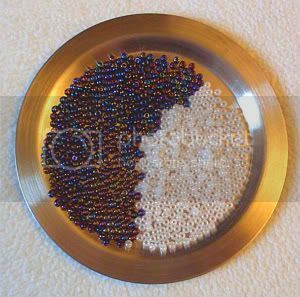 Complete instructions for this project are available on Variety Beading: Christmas Projects. Try out a new Christmas design, or create on of your own, and post your Christmas beading story on the Beading Challenge Forum. November 16-22 is Bullying Awareness Week, a time when communities, families and other groups can come together to discuss what kinds of actions they can take to help protect children and adults from abusive behavior from their peers. Although we live in a world where being original or different is more like the norm, there are still people who attempt to over power those around them with words and even violence. To help prevent these situations from happening, organizations can support the cause of Bullying Awareness, and educate teachers, employers and other leaders in all aspects of the bullying issue. From causes to solutions, the more we know, the safer and more supportive our environments can be. The unofficial color for Bullying Awareness is pink. Groups that are spreading the word about this important cause wear pink, and share the story of a pair of bullies that were stopped in their tracks by some incredibly thoughtful and brave teens. Like many people, pink isn't a big color in my wardrobe. But even though I don't own any pink shirts, doesn't mean that I can't show my support, too. With a great piece of pink jewelry, I can stand up against bullies everywhere, and help get people talking about this important issue. 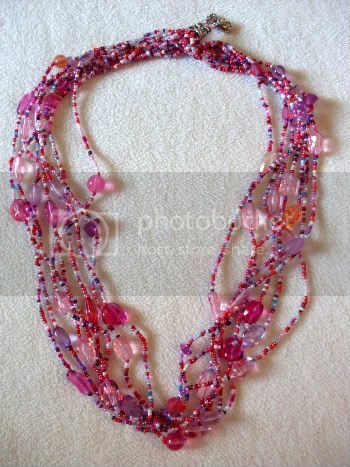 This homemade mixture of beads consists of assorted pink acrylics, and a careful selection of seed beads. Most of the mix is made from different shades of pink and red, with a splash or two of white, blue, purple and magenta. 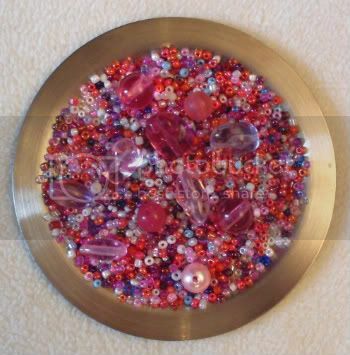 The over all affect is a diverse group of beads that come together to make one big, pink collage. This necklace was fun and easy to make. Although I don't own a bead spinner, I still love stringing random beads once in awhile. It takes the pressure off as a designer - I just let the beads tell the story on their own. I did make sure that the accent beads where more or less evenly spaced, counting out how many I would need per strand and trying to create a nice flow of shapes and sizes. I hope that beaders everywhere will pull out their best pink pieces to wear next week, and get their peers talking about what we can do to stop bullying!